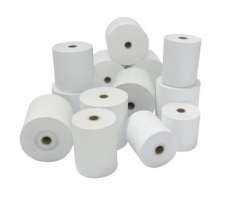 Excellent paper quality ensures an elegant touch this particularly white paper is rolled from especially high-quality brand paper, which was certified for use with Epson printers. You can be certain that the print head and mechanics of the printer will be spared and no warranty issues will arise. Of course the paper, which we offer in the most diverse widths and diameters, is also suitable for other printers and POS systems.